It’s a garden in a valley on the ocean. 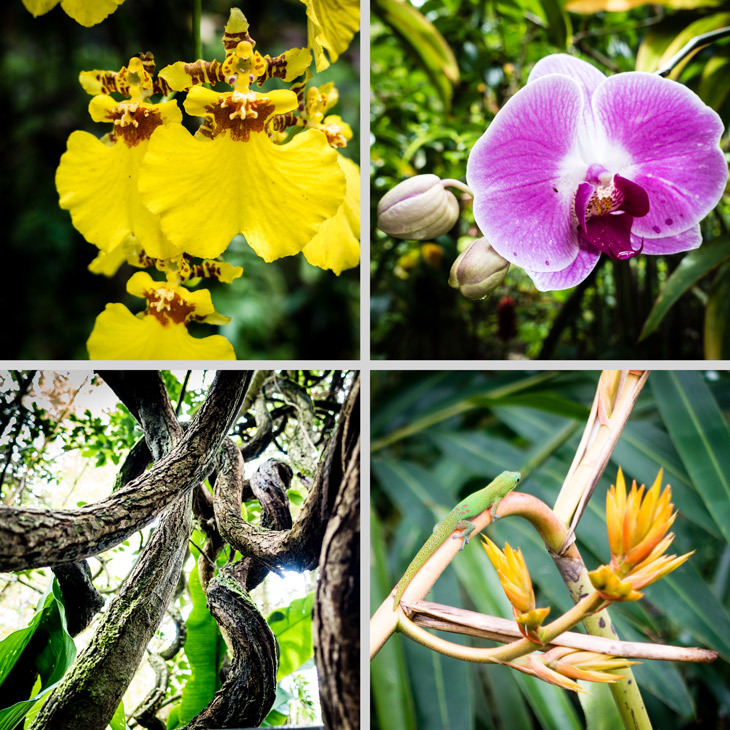 There are only 1.25 miles of garden trails, but it took three hours to walk, gawk, and photograph the 2,500 species of tropical flowers and plants at the Hawaii Tropical Botanical Garden. Founders Dan and Pauline Lutenhouse spent six years hand-clearing impenetrable tropical jungle to create the trails that wind through rainforest and along streams to the rugged ocean coastline. Hilo is located on the lush (that means wet) side of Hawaii’s Big Island, but our timing was excellent: many orchids were in bloom, and it didn’t rain! David, a fellow passenger who lives in Hawaii, recommended the Hawaii Tropical Botanical Garden. Rus and Denise wanted to go there, too, and they kindly invited us to share their rental car for what turned out to be a thoroughly enjoyable (and inexpensive) double-date. Other stops included Akaka Falls State Park, where one dollar admission gives you two big and several small waterfalls, and Botanical World Adventure, where we stood on a picnic table for a better view of Kamae’e Falls. Rus and Denise introduced us to Hawaiian shave ice. While shave ice resembles a snow cone, snow cones are made with crushed, rather than shaved, ice. 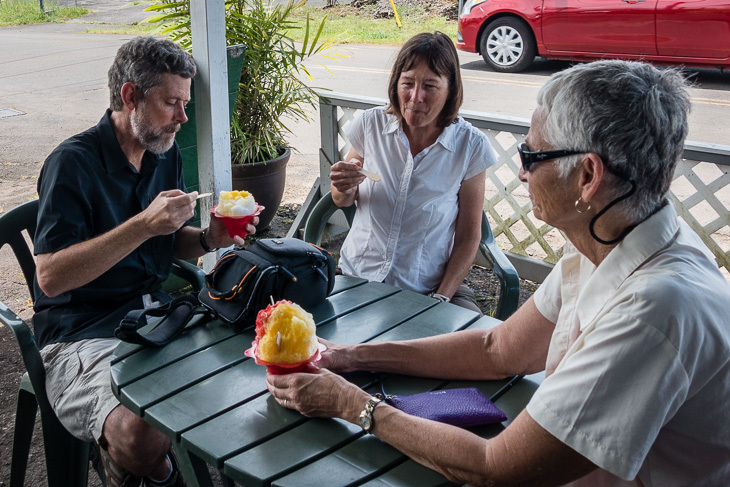 Shave ice servings are large, so unless you are a real fan of water and sugary syrup, order one with two spoons, so that you can share with a friend. We were a bit worried when we saw that outrigger canoe rides at Star Beachboys were so inexpensive – half the going rate. “It’s my first time steering,” said Alika, our captain. He might have been joking, but maybe not. It was Sunday morning, and no captains had shown up for work at any of the five beach companies we had already approached. 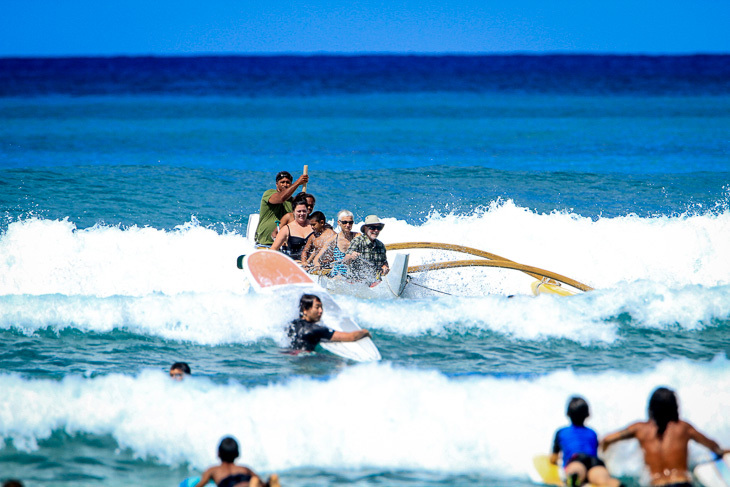 No life jackets, safety briefing, or waiver forms were in evidence – just hop in the yellow outrigger, $15 for three waves. Also in the boat were Olivia (assistant captain), Alika’s son, the photographer’s son, and an Australian woman who happened along as we were launching. The scariest part was worrying how Alika would steer us through the dozens of surfers. Alika’s response: “Don’t worry about the surfers; there are plenty more where they came from.” This was a touristy but fun ride on Waikiki Beach, one of the most famous beaches in the world. If you go, remember this is a water sport, and you will get wet. 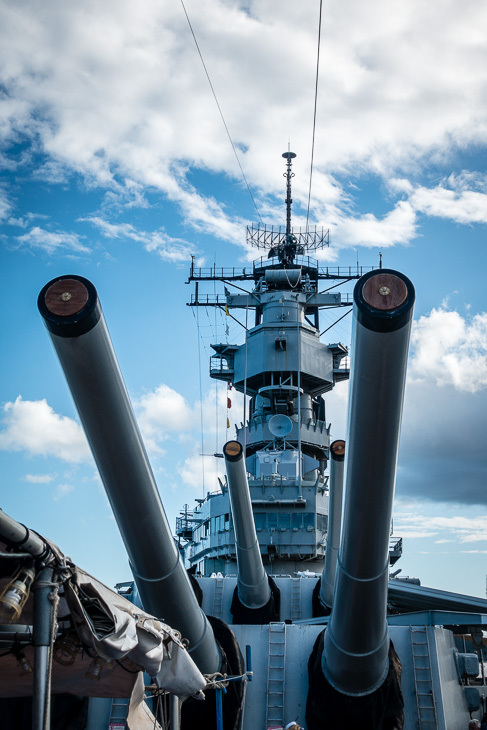 In the evening we joined fellow shipmates for a tour of the battleship USS Missouri, on whose decks the Japanese surrendered, ending World War II. Cocktails, pupus (appetizers), and entertainment were provided in this special Around the World Event hosted by Oceania Cruises. What did we buy at Walmart? A new waterproof camera to replace the old one (which died underwater in Rangiroa) and a new pair sunglasses for Doug (yes, another pair lost!). Six turtles were at the cleaning station when we jumped into the water at Olowalu Reef, also called Turtle Reef. 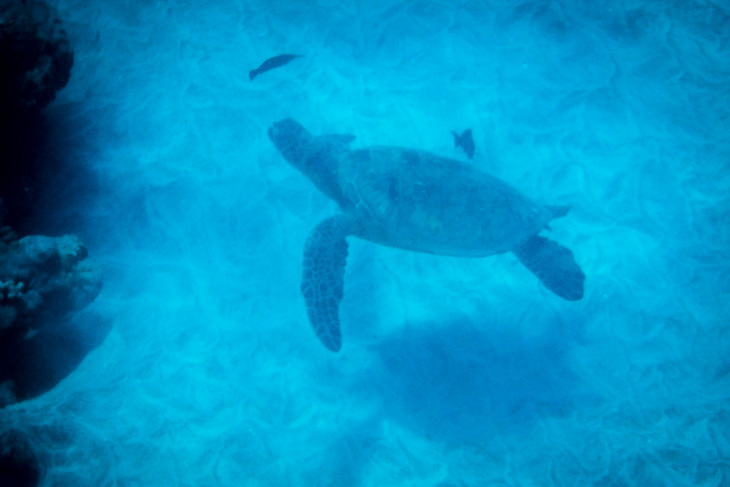 Did you know that green sea turtles grow algae on their shells, and they need thorough, gentle cleaning? Fortunately, the reef has a large population of wrasse, toby, tangs, and surgeon fish that make up the cleaning crews. The turtles simply pull up to a cleaning station, and the fish go to work cleaning off the algae, dead skin, and parasites from their shells. Olowalu Reef is a perfect spot for underwater exploration, because it’s a safe and really, really big area with great visibility and plenty to see: coral and colourful fish, in addition to the turtles consistently found here. 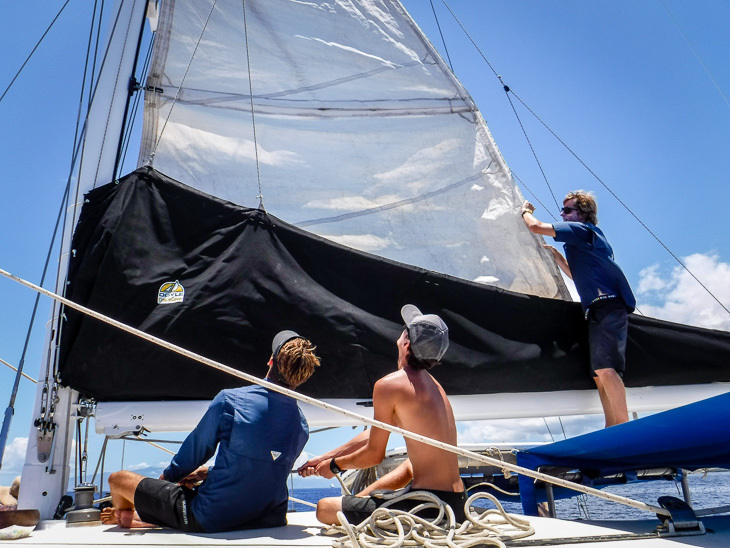 A sailing catamaran brought us to the Reef. Captain Caleb and his crew Adam, Chandler, and Tyler took good care of us, on a tour titled Trilogy West Maui Snorkel Sail. It was a dead-calm day, which meant the sails didn’t really come into play, but the calm weather conditions were ideal for snorkeling. “I’ll be wearing my Indiana Jones hat,” said Jay, in a note arranging to pick us up near the cruise terminal. The hat was appropriate, as our first stop was a spot used to portray the jungle in the Indiana Jones movie Raiders of the Lost Ark. 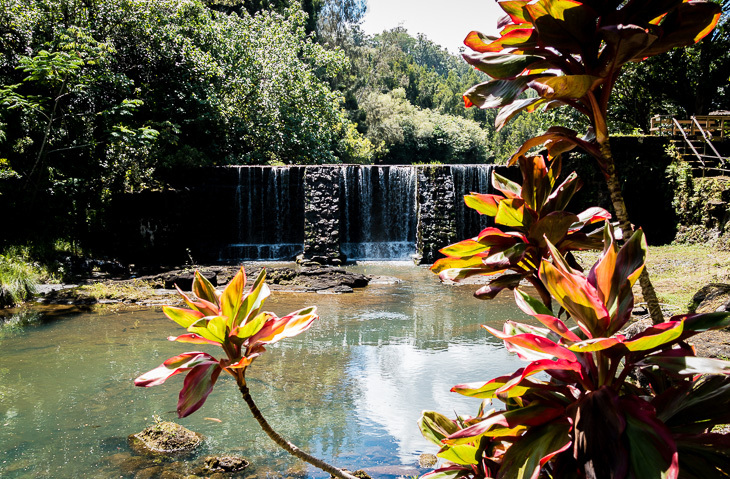 Our day with Jay was a wander that included famous movie locations and scenic overlooks as well as off-the-beaten tracks spots such as an old guava plantation and an historic stone dam that supplied water for the Kilauea Sugar Plantation. Kauai is naturally beautiful. Because it’s the wettest place on earth, the valleys and forests are impossibly green. Kauai used to be covered with sugarcane plantations. Today, most of the plantations are gone, but you can still find sugarcane grown here, as well as papaya, pineapple, bananas, and wetland taro. 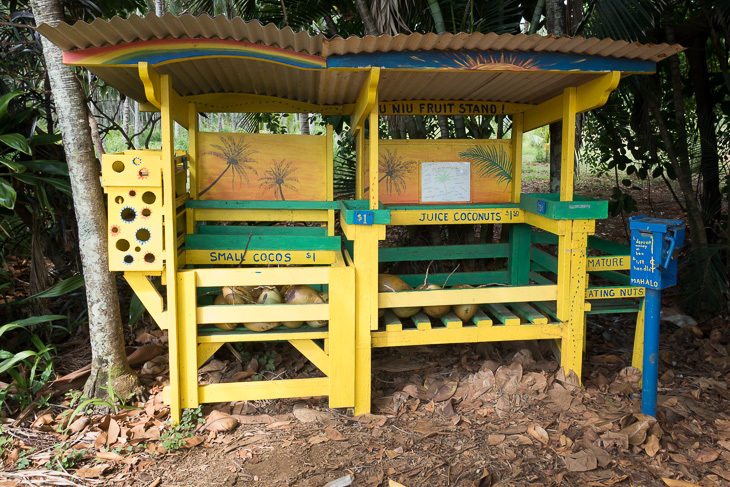 Jay knows every mango tree and every local fruit stand; mangoes are in season, and the bananas are super-sweet. Kauai is part of the USA, but it looks like another country. It has an end-of-the-road feel and, as such, it attracts quirky people. Jay is a local character, and we mean that in a good way. If you are coming to Kauai, Lightly Kauai Tours is the name of Jay’s company, and he offers a variety of guided sightseeing and light hiking tours. Our taxi driver had never been to La Habra Heights. He was in his eighties, and he was hard-of-hearing, as is Doug, but with Mapquest and teamwork the three of us made our way from the San Pedro cruise pier to our son’s home in just over an hour. Their home is huge. Our son, Alec, likes large-scale items, and lots of them; he was keen to show us his fleet of new bicycles, one for every road surface and every type of race. Angie has been busy re-decorating, which involves hanging Alec’s trophy heads, as well as selecting paint colours. Artwork has been supplied by the three artists-in residence: Nathan, Scarlett, and Robin, ages 12, 10, and 9. Nathan remains interested in World War II (especially D-Day). Scarlett and Robin played us a few piano pieces (an Irish dance and a duet), and they told us all about the baby chickens. 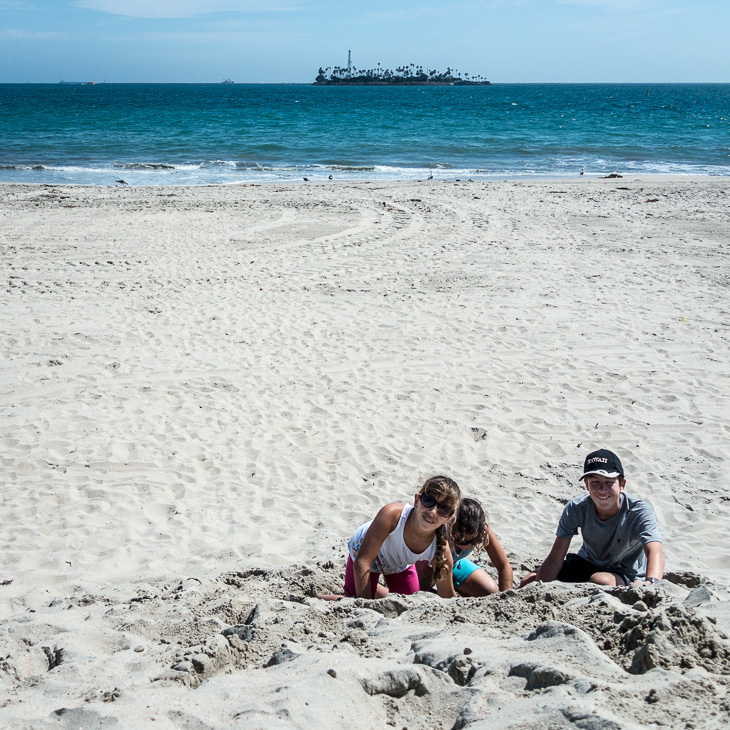 Nathan, Scarlett, and Robin are growing up, but not completely. At the beach they are still thrilled by a large pile of sand, and they can’t resist running into the surf, even when they’ve been cautioned to keep their pants dry. Stay young, kids! “I missed those kids already,” sighed Doug, as we boarded the ship at 7 p.m. after a day that was too short. We had missed the scheduled lifeboat drill, but we weren’t off the hook. Shortly before sailing we and the other delinquents were summoned to the lounge for a make-up safety briefing. With a heavy heart we left Los Angeles, but how could we not be cheered by San Diego? This attractive and friendly city is loaded with attractions, and we docked right in the centre of the action. 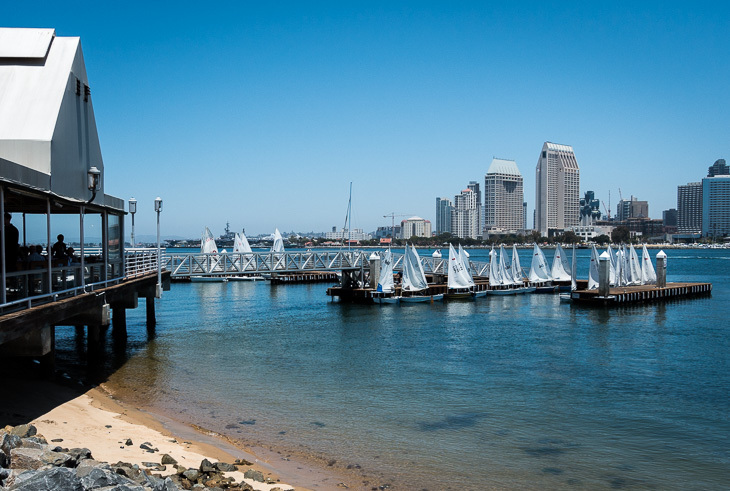 Dashing off the ship at 8 a.m., we boarded the (free) commuter ferry that crosses the bay to Coronado, known for its expansive beaches and the red-roofed Hotel del Coronado. 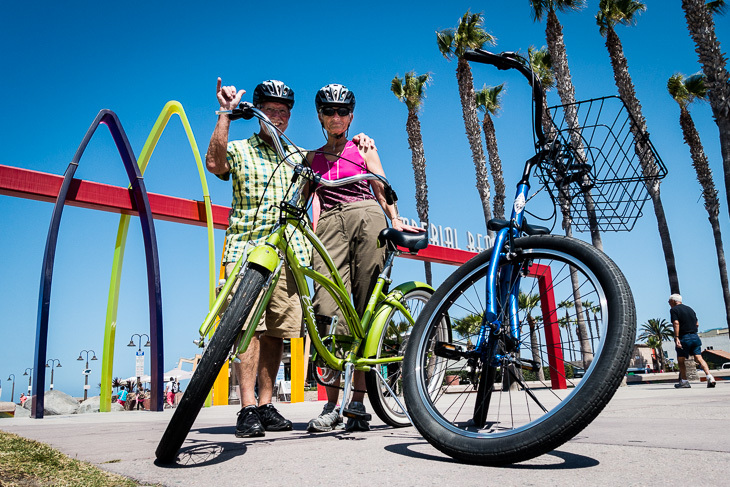 By 9 a.m. we were on rented bicycles, heading down the Silver Strand bikeway to the super-cute surf town Imperial Beach (24 miles/38 km, return). A golf course, two state beaches, resorts, and a national wildlife refuge are sights along the way. It is familiar and soothing territory, as we biked this route many times in our snowbirding days. 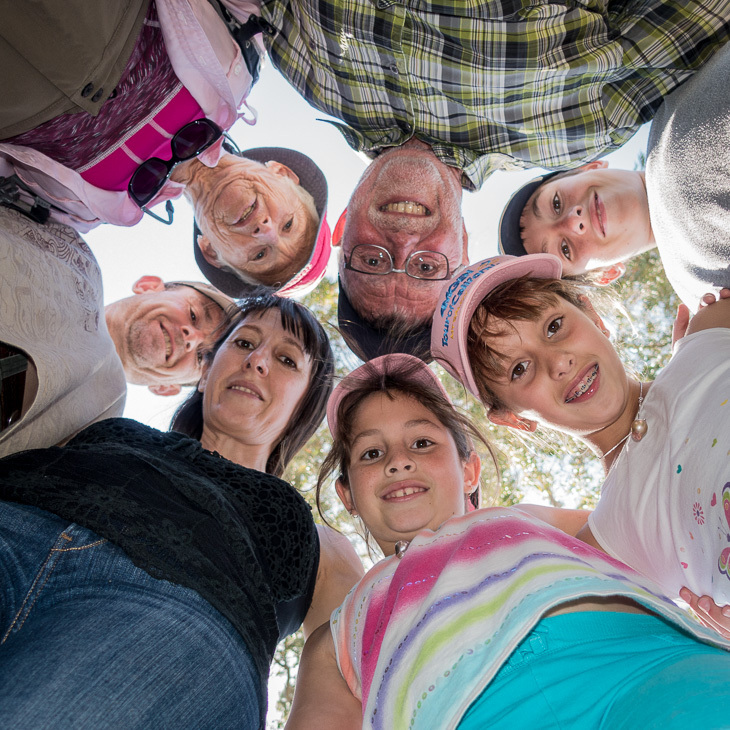 We still miss those grandchildren, but it’s time to focus on the final segment of the cruise. Just six countries and eight ports to go until we reach Miami July 8. 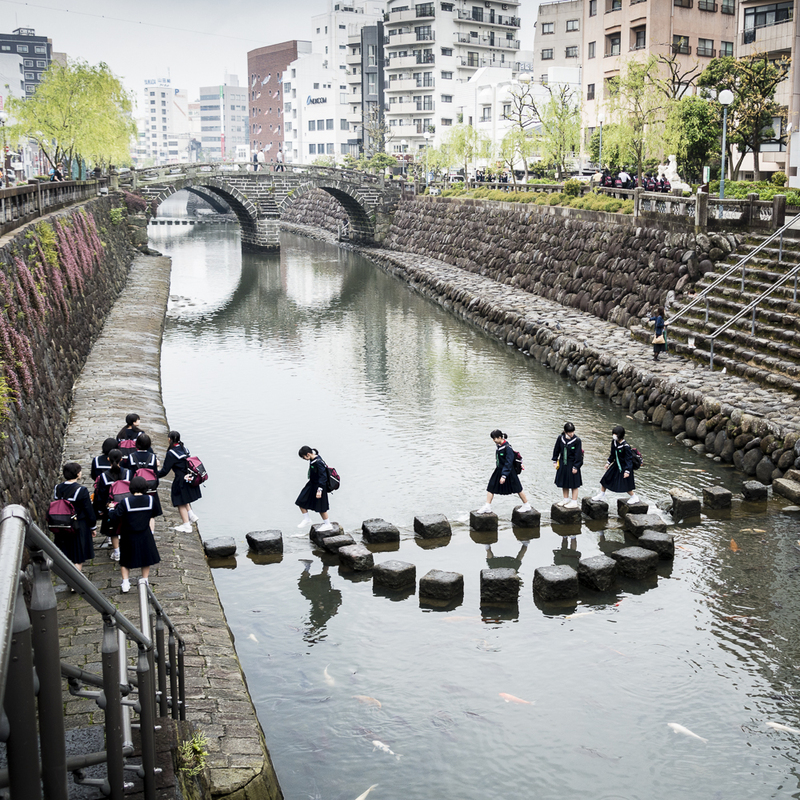 Doug was honoured to receive a prize for taking the best photograph in the “Local People and Culture” category in a contest held aboard the Insignia. The photo originally appeared in this blog in the post entitled Countries, not Wars and is reproduced below. This entry was posted in Bikes, Boats, Boots, California, Cruise, Hawaii, Los Angeles, USA and tagged Hawaii Tropical Botanical Garden, Hawaiian shave ice, Hiking, Kayaking, Sailing, sea turtles. Bookmark the permalink. Ah, I travel with you and hear the songs of the Islands and the sweet perfume of the flowers, and mangos…don’t get me started. Fortunately berries are a month earlier here this summer so I don’t feel so deprived. Miss you and look forward to visiting in person soon. Thanks, Dorothy. Your words sound like poetry. We miss you too and will be back in Victoria in two weeks. Hope we don’t miss the berries. Great job as always! I love reading your blog and seeing your awesome pictures! Maybe we can get together one more time before this wonderful trip comes to an end. Glad you like the blog, Sam. It was an honour getting the photo prize.